This entry was posted in Film, Poetry and tagged Art, Dystopia, Film Poster, Fritz Lang, Metropolis, poetry. Bookmark the permalink. Thank you for this. 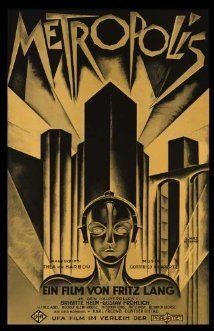 Metropolis is a wordless poem as a film AND the poster is an expression of that poem. Great movie! I just watched it for the first time last month and it was lots of fun. When you consider that it was a 1927 film the techniques are just fabulous. And the poster!! No wonder the Nazis hated it and him. Thank you for this.